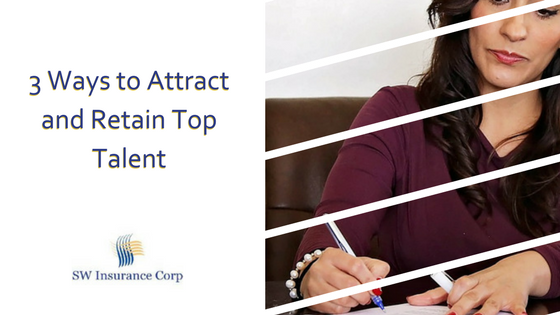 3 Ways to Attract and Retain Top Talent | SW Insurance Corp. Attracting the brightest talent without breaking the budget can seem impossible. The truth is, attracting (and keeping) the best and the brightest isn’t just about how much money you’re paying them. We’re going to share the top three ways you can attract new employees AND keep them thrilled to work for you. It’s imperative that you show how much your staff’s wellbeing means to your company. Today’s employees are motivated by being a part of something meaningful. They want to support things like outreach programs and charitable causes. Set up options that allow them to contribute to specific causes via automatic payroll deductions. Create company-led initiatives that allow teams of employees to help at food kitchens, homeless shelters, and halfway houses. Offer up opportunities for employees to volunteer during work hours for their preferred causes a certain number of times per year. Create social and print media that highlights the contributions of your employees to the community. You may already offer medical benefits, but there are additional avenues you can consider. Offer legal plans that give access to legal counsel for little to no cost. This can cover speeding tickets, parking tickets, living wills, landlord issues, and more. Identify theft protection plans are another option. As the Equifax Data Breach proved, all it takes is one mistake for others to gain access to your identity. Identity theft protection programs take the fear from your employees and lets them rely on a service designed to protect them and repair any identity theft issues that may arise in the future. Technology has changed the way we view productivity and accessibility to company resources. People want to experience life, not spend all of it “grinding” their way through the days. If your company can do so, consider flexible working arrangements. Consider a work from home option every now and then, where people can work from whatever location they choose and still complete the company work. Some companies are adopting this practice as an alternative for using sick days when life interrupts. Does your schedule require a traditional time clock, or can you offer staggered work schedules for those who need to come in later or earlier? If not, why not consider it? Flextime, or flexible scheduling is a great alternative to the traditional workweek. Traveling to and from work outside of normal commute hours can help avoid rush-hour traffic. This will lead to a more relaxed beginning to the work day. Five days a week or four? Some companies even offer the 4/10 workweek. This allows people to work four 10-hour days in the office, followed by three days off. Another option is the 9/80 arrangement. Individuals work nine-hour days Monday through Thursday and then get every other Friday off. Whatever you decide to do, make sure you spread the word about your offerings, so the world knows how much you care about your employees. When word gets out how well you treat your employees, you’ll have top talent knocking at your door. SW Insurance Corp cares about helping your company be the best it can be. Give us a call and see how we can help you find and keep the best employees.